Kicking off the show with a song titled “Blind Sighted Faith,” the band onstage was an instant hit at the University of California, Santa Barbara’s Student Appreciation Event on April 26. The annual concert took place at noon and was held by the Arts & Lectures program. During the show, I could hear people murmuring excitedly, asking who the guys on stage were and what the name of the band was. To elaborate, The Dunwells are a British folk-rock group from Leeds, England, and have been on the rise since their formation in 2009. The band consists of five members, who all sing vocals: two brothers—Joseph Dunwell, who sings lead vocals and plays the guitar, and David Dunwell, who plays the guitar, piano, and banjo; their childhood friend Johnny Lamb, who plays the drums; Lamb’s cousin, Rob Clayton, who plays the bass guitar; and David Hanson, who plays lead guitar and pedal steel. 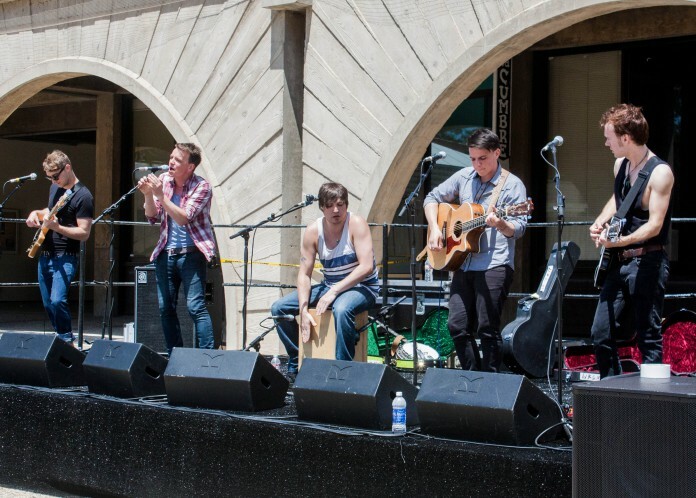 Touring the United States and United Kingdom, The Dunwells have performed at Austin City Limits, Red Rocks, Lollapalooza, and The Tonight Show with Jay Leno. They have also opened for Mumford and Sons, whom they are often compared to. However, The Dunwells experiment with electro-acoustic sounds rather than only organic music, and Joseph’s voice, while still remaining folksy, sounds cleaner and more fitting for alternative rock, bringing to mind the lead singer Anthony Followill of Kings of Leon. The Dunwells also show their roots in Americana, country, alternative rock and Celtic rather than in straight indie-folk, giving them a sound that differs from other folk groups like Mumford and Sons and Fleet Foxes. Joseph’s sharp and distinct voice seemed limitless as he sang a long falsetto during the concert, eliciting chuckles from his brother and cheers from the crowd. But Joseph is not the only band member who has the ability to sing. The other band members are all blessed with a pair of apt lungs and a pair of discerning ears that aid their harmonizations, a praised characteristic of The Dunwells. The layering of their varying pitches during the show melted into a sound that swept through Storke Tower, and the initial crowd of few grew significantly. Students passing by would stop and listen, until they had to move on to their next appointments. “I liked their Celtic and country mix…their guitars, drum beat, rhythm, and stamping of it,” said Imogen Faris, a third-year foreign exchange student from London, England, who is majoring in English literature. The Dunwells performed songs from their debut album, “Blind Sighted Faith,” which was released on Feb. 14, 2012 and produced by John Porter, the nine-time Grammy winner who has produced for artists like The Smiths, Los Lonely Boys and Ryan Adams. Along with “Blind Sighted Faith,” The Dunwells performed “Elizabeth,” which reached number 31 on the UK Indie Charts, and “So Beautiful,” amongst other songs. The Dunwells’ acclaimed harmonizing skill was especially noticeable in this acoustic cover, and unlike R&B Jason Derulo’s pop rendition of this song, The Dunwells’ cover transformed the already folktronica sound of “Hide and Seek” into a sweet but soulfully sad love song. Joseph’s vocals delivered rich overtones that gave the song a mournful, rustic twist. The Dunwells were given an encore, and they happily performed another song for the eager crowd.